GRO-KASHI is based upon an ancient fermentation concept ( Bokashi aka Silage ) utilized in all cultures. Learn more about this ancestral fermentation techniques used by humans for healing and connecting to nature. These fermented liquids (Kvass, Kombucha, Beer, Wine, Mead, etc.) have provided essential enzymes and antioxidants for human survival for thousands of years. The leftovers, called the dregs, became drugs for humans as well as a specialty fertilizer for the garden. These brews contain high amounts of probiotics which would preserve foods for long periods of time and deliver immense amounts of nutrition. The bacteria and fungi, which digested and fermented the foods, added additional metabolites and enzymes that made the end product better than it started! Preserved foods would easily last throughout the cold winters while strengthening the body. The beneficial microorganisms living in these brews were used outside in the garden soil at the start of the new harvest season to revive the soil. GRO-KASHI is a fully-loaded battle chest for nature’s superheroes to create life in the harshest climates. Send your microorganisms into battle equipped with the finest minerals and nutrients made bio-available by a scientifically fine-tuned solid state fermentation process. Fermentation in ancient times kept many people alive. Not only does it preserve the harvest through the winter, but it was a source of healing medicine. Ancient bone records show that the fermenting of beer and other drinks produced compounds that boosted immune systems. Meads and other brew turned water into an elixir of enzymes, antioxidants, and vitamins. Fermented products like Kvass were used to heal common ailments and known to put humans in touch with sacred realms. GRO-KASHI is mostly organic, ancient red wheat bran fermented with Effective Microorganisms, a technology created by Dr. Higa in Japan. This consortia of beneficial bacteria and fungi have been selected and sourced from our earth to provide regenerative and symbiosis in natural systems. Many of these microorganisms are useful in the soil for decomposition, immune defense, mineral update, and water retention. Scientists have discovered that these microorganisms, many of which are naturally found in the human body, are also useful for cleaning up oil spills and algae-filled lakes. Plants grown with probiotics and prebiotics like GRO-KASHI can be shown to have higher levels of mineral density using a BRIX meter. Higher mineral density is correlated with plant health and overall flavor. The probiotics help break down the rocks and minerals in order to deliver humic to the plants. In a synthetic system, plants often cannot absorb all essential minerals it needs to grow. By using GRO-KASHI, you are essentially giving the plant what it needs to feed a healthy and strong human being. The plant will have, in its soil, everything we need to live symbiotically with the earth. The bacteria and fungi, are equipped with the GRO-KASHI which was specially formulated to keep the microbes alive and flourishing. The goal is to have more nutritious plants and a more nutritious farmer by the end of the season! By observing and feeling the forces of nature, we can learn to capture its beneficial elements for our own healing and prosperity. With no one to water the plants and fertilize the soil, how does the forest stay alive? The key is in the mycelium network of bacteria and fungi which lives around the roots and into the farthest depths of the Earth. 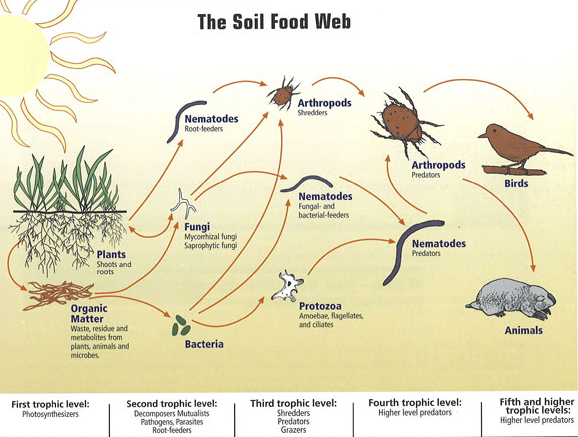 Within the soil is a mass web of microorganisms that connects the entire soil environment and transports water, nutrients and living organisms throughout the forest in an intelligent web-like manner. When an animal leaves manure in the soil, the mycelium sends up decomposing organisms to break down the manure into nutrients that are evenly distributed to the plant in the entire forest. GRO-KASHI mainly contains anaerobic bacteria and some strains of fungi that live harmoniously with the plant. Because GRO-KASHI absorbs an unimaginable range of probiotics during its birthing process, we do not guarantee microbes on our product label or to the public. Our hand-made, living product is different from most lab-made probiotics at the garden store. Probiotics are the life of the soil, breaking down minerals, producing humics, and intelligently coordinating the immune and nutrient uptake systems in the soil. These beneficial and anaerobic bacteria work side-by-side with additional aerated microbes and soil life to form the crucial soil web. GRO-KASHI can make a plant grow to its full potential with little more than compost, water and minerals. FACT: Humans have 10x more microbial cells than human cells. How do forests survive in nature without automatic sprinklers and chemical nutrients and pesticides? 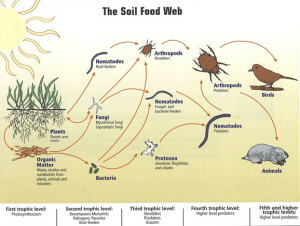 The answer is through the cooperation of millions of organisms working together above and below the surface of the soil. “We know more about the movement of celestial bodies than about the soil underfoot.” – Leonardo Da Vinci. In nature, everything happens harmoniously. It does not require any human work or synthetic addition. Plants grown without pesticides produce salvestrol which help fight cancer! To learn much more about probiotic farming and the benefits of probiotics, please visit the Probiotic Farmers Alliance on Facebook! I thought bokashi was a title created in 1983 by kani city citizens to respond to composting issues with state ran sanitation. Based off of techniques learned in Thailand and Korea from ancestors that migrated from Nile.Would love for you to explain to me step by step process tangy tangerine is processed. Is probiotic culturing of whole foods or is patented bacteria added after dehydrate ..like fortification? ?? Also how do they have a powder have so much bioavailability????? ?